As Ford took the lead in personally providing benefits, high wages, and social welfare programs for his employees, he vehemently opposed the United Automobile Workers (UAW) Union. The Employers’ Association of Detroit, of which the Ford Motor Company belonged, successfully prevented companies from unionizing until the 1930’s. Pressure continued to mount until Ford was ready to close up shop to prevent unionization. However, Clara stepped in and threatened to leave him if he destroyed the family business. Therefore, he relented. Ford also rejected financing companies for his cars, seeing it as a means of putting consumers into debt. Nevertheless, falling sales, the Great Depression, financing at competitors, and prodding from his son forced him to surrender this policy as well. Although known almost exclusively for his cars, Ford dabbled in other revolutionary ideas and inventions. When designing his Piquette Avenue Plant, Ford instructed the architects to include a sprinkler system within the building, a rarity at the time. He promoted his vehicles on the racetrack and was one of the first supporters of the Indianapolis 500. Ford and his brother-in-law, E.G. Kingsford, found a creative use for the wood scraps gathered at the Ford factory. Today, “Kingsford” charcoal briquettes are as familiar and loved as Ford trucks. In the late 1920’s, Ford reunited with his former boss, Thomas Edison, and joined Harvey Samuel Firestone in a quest to find a local material to make rubber, establishing the Edison Botanic Research Corp. He even published his own newspaper from 1919 to 1927 titled The Dearborn Independent, but ceased production following several defamation and libel lawsuits due to anti-Semitic articles. Despite his name on the by-line, Ford contended he did not know the content of the articles. Regardless, he has forever been branded an anti-Semite in the history books. A devote Episcopalian, Ford’s pacifism in World War I was well-known. Although a firm believer in America’s economic independence, he also supported international trade as a means of peace. Therefore, despite being a Republican, he fully supported Democrat President Woodrow Wilson’s League of Nations proposal. (see One World Disorder) As a result, Wilson asked Ford to run for the United States Senate in Michigan in 1918 as a Democrat. Ford ran, but put no financing or effort into his bid. Surprisingly, he lost by only a few thousand votes. Despite his opposition to World War I, Ford joined other automobile companies in building Liberty engines for warplanes. Production returned to exclusively automobile making following the war until Ford purchased the Stout Metal Airplane Company. The 12 passenger Ford 4AT Trimotor, or “Tin Goose,” flew its initial flight on June, 11, 1926, going on to become the U.S.’s first successful passenger airliner. In addition, the U.S. Army borrowed its design for several of their aircraft. Once the Great Depression started, sales declined, forcing Ford to close his airplane division in 1933. As other auto manufacturers modified their design, Ford continued to resist updating the Model T until sales fell too low for the company. His son convinced him to finally produce another car, of which he redesigned and reintroduced his Model A. Over time, he and other automakers followed General Motors lead of introducing a new model annually. Around the time he launched the Model A, Ford brought to reality his idea of a single production location. His new plant included facilities to produce glass and steel along with all the other components necessary for his cars. However, he also remained committed to the idea that international trade promoted peace. Therefore, he opened several plants throughout the globe. Following Edsel’s premature death to cancer in 1943, the aged Ford resumed the position of president of the Ford Motor Company. However, his own failing health due to multiple strokes took its toll on the company as it lost over $10 million every month. Democrat President Franklin Roosevelt contemplated a government takeover to guarantee war production, but it never happened. The government tried again to take over Ford in 2008, successfully orchestrating a bailout of automobile manufacturers. Yet Ford held true to its founder and refused the government’s money. Following the war, Ford relinquished his position to his grandson, Henry Ford II, in September of 1945. Henry Ford died at his home in Dearborn, Michigan, on April 7, 1947, at age 83. Ford started construction on his Piquette Avenue Plant on May 10, 1904, with the company moving in in October. In today’s atmosphere, with so many local, state, and federal regulations, a business owner couldn’t even get a permit to start designing a plant in that time. Therefore, as a result of progressive policies, America hasn’t been a true capitalist country since the beginning of the 20th Century, with much of it dying along with Ford’s generation. Liberty, when you drop a pebble in water, small ripples begin. But they quickly continue outward until they fill the area, touching the farthest reaches of the pond. No one is perfect, and neither was Ford. But there is no doubt his work and his success didn’t just benefit himself and his family. It provided jobs, security, and affordable cars for millions of people worldwide. He didn’t just change his life, or even the lives of his employees. He changed society across the globe. Henry Ford is just one example of how American capitalism, and we as humans, can make ripples. Find a purpose, Liberty. Find a passion. And be that pebble that moves the world. After years of designing, constructing and recalculating, 32-year-old Henry opened the doors of his shed to test his first automobile design. Except, it was too wide to get out. Refusing to be delayed, he smashed the brick doorway with an axe, driving his Quadricycle out into the world early in the morning on June 4, 1896. The two-cylinder, four-horsepower engine carried the light metal frame on four bicycle wheels down Grand River Avenue in Detroit at less than 20 miles per hour. Henry’s first time behind the wheel of any car, particularly one that lacked brakes and a reverse, proved to be a success. What commenced following this historical day is an amazing American success story. However, as with almost every famous rags to riches account, it centers on the life of a person with a strong will, firm convictions, deep faith, controversial actions, and a brilliant mind. William and Mary Ford welcomed their son Henry on July 30, 1863, in Greenfield Township, Michigan. Ford helped tend his family farm in his teenage years, but primarily because of his love for his mother, who passed when he was 13. His heart was never into farm work as his passion was for mechanics. As a result, he left home at age 16 to become an apprentice machinist at Detroit Dry Dock Company in nearby Detroit. Following the completion of his apprenticeship, Ford returned home to assist his father on the farm. He quickly became proficient with the workings and operation of the Westinghouse portable steam engine while demonstrating the engine for the company at local farms in the summer. Ford spent his winters constructing a lighter steam engine. Following Ford’s marriage to Clara Bryant in 1888, he received a substantial tract of land on the family farm from his father. The young couple built a home, sawmill, and workshop on the land, but it did not soothe Ford’s soul. He needed to be back in the big city. So, in 1891, they packed up and moved to Detroit, where Ford obtained a job with the Edison Illuminating Company. Two years later, the couple welcomed their only child, Edsel, to the family. During this same time, the world was becoming familiar with the “horseless carriage,” however only the very rich and the very privileged had one. Despite Ford not choosing farming as personal career, he truly understood the farmer’s plight and hardships. He was determined to produce a car that would allow the poor, hardworking individuals an affordable automobile. Therefore, Ford spent his off time tinkering on a gasoline engine with an electric ignition. 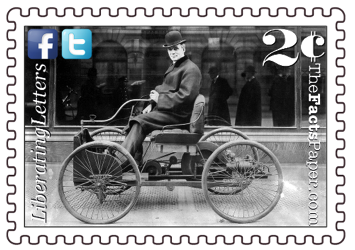 Following the debut of his Quadricycle, Ford failed getting two different motor companies off the ground before finding success with the Ford Motor Company. Intensely dedicated to providing a well made automobile at an affordable price, the company produced its first car, the Model A, selling the first one on July 15, 1903, for $850. While much cheaper than every other car, Ford was not satisfied. To cut costs even further, he changed the steel type, removed many of the extra and extravagant features, and reduced the color of the car to just black as it dried the fastest. Ford quipped in his autobiography that, "Any customer can have a car painted any color that he wants so long as it is black". The result was the Model T, first produced in 1908. A shrewd businessman, Ford continually sought out ways to not only make his product better, but his employees and company as well. While the history books often cite Ford as the inventor of the assembly line, he more accurately utilized the first motorized one. Familiar with the concept, employees in the Piquette Avenue Plant started experimenting with an assembly line on a conveyer belt with the production of the Model T, or Tin Lizzie. Assembly time of one vehicle was cut from a day and a half to ninety minutes. As a result, they assembled a record 101 cars on June 4, 1908, alone. The combination of decreased assembly time and increased production allowed Ford to drop the price of the Model T to just $300, quickly making it the most widely purchased car in the states. By the end of its run in 1927, over 15 million Model T’s were produced. Ford believed in “welfare capitalism” or “capitalism characterized by a concern for the welfare of various social groupings (as workers)” brought about by programs offered by the company to improve the welfare of their employees. At the time, workers labored nine hours a day for $2.34. In 1914, Ford took the initiative to both increase the daily wage to $5, but also decreased shifts to 8 hours. On May 1, 1926, Ford employees’ workweek was further reduced from six days to five. Ford surmised the results of extra leisure time would be twofold. First, it would increase productivity. Second, employees would have more free time, as well as more wages, to consume his products and others, boosting the economy. Wanting to attract experienced, proficient workers, Ford was convinced offering such appealing incentives in the already high wage Detroit would do just that while reducing turnover. As predicted, well-trained employees flooded Detroit. Thanks to the free market, the other automotive companies followed suit so as to compete with Ford. Before long, industries worldwide adopted the term “Fordism,” to describe producing modest goods accompanied by high wages. As another precedent, Ford eagerly hired women and minorities at a time when it was not common to do so. Before long, Ford Motor Company turned enough profit that Ford devised a profit-sharing opportunity of which employees over six months could participate. However, in efforts to maintain a high standard in society, recipients were encouraged to refrain from heavy drinking and gambling while ensuring dads responsible for child support were following through. Although the majority of employees immediately qualified, the policy received criticism as intrusive as Ford’s Social Department hired people just to monitor the requirements. As a result, Ford eventually dropped the conditions. Business grew as the low priced Ford became the most popular car in the states. Not only were fellow successful entrepreneurs like Madam C.J. Walker able to afford his Tin Lizzie, so were middle and lower class Americans as half of the cars on the road by 1918 were Model T’s. (see Secret of Her Success) The next year, Ford turned the company’s presidency over to his son Edsel, while retaining operational control. Following a dispute with stockholders in 1920, Ford bought them out, obtaining complete control of the company.